I was recommended to check out The Willpower Instinct, by professor Kelly McGonigal, and it’s a favorite read of the year. Maybe I should write a review of it, it’s so yummy!? In it she writes about how the brain works, why some things are so difficult to do and others not, and in each chapter she gives you ideas to try out. She also challenges the reader to pick a small challenge, like creating a daily meditation practice, and keep at it and notice where and when it’s easy and when resistence and procrastination comes up… I love that challenge, and with the Insight Timer app, I am still at it. Viljestyrka is willpower in Swedish. Embroidery by my mom made in January – for my word of the year 2014. Love it, thanks mom! NY Times writes: Willpower — or the lack of it. We hear about it a lot. We can blame overeating, overspending, undersaving and the subprime mortgage mess on a failure of self-control. But is that right? Are we devoid of the inner discipline and stronger character our parents and grandparents apparently had? Recognize that creating a new habit is like making money. It doesn’t happen overnight. You must view it as a process, with a few starts and stops, rather than something that is going to happen just because you’ve decided to make it happen. Creating a new habit is an endeavor with many moving parts that are sometimes out of your control, so go into it knowing that your journey may not be linear. It might zig and zag at times. An introduction from a clinical perspective – interesting read indeed! Many people believe they could improve their lives if only they had more of that mysterious thing called willpower… How about you? I’d say my word of the year has helped me grow this year so far, and it’s still with me. I had no idea how scientific and interesting reading about willpower would be, but I love this kind of stuff so much! I think that must mean it was a good fit for me. What is your word, and how is it going? What are you doing with it? 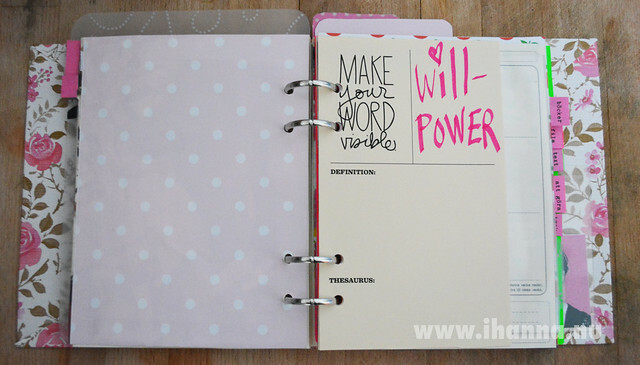 This entry was posted in Creative habits, Inspiration and tagged link love, one little word, willpower. Bookmark the permalink. Fabulous post, Hanna, & I am enjoying researching into all of the links too! I love the embroidery your mom made you Hanna! how special and so colorful :) this post reminded me to ask if your going to do planner pages/calendar for 2015?